If I do not like the color of my teeth, is teeth whitening the best solution? You will obtain the answer to this question after a consultation with your dentist. Your dentist will perform a thorough oral examination including X-rays to gauge the cause of the discoloration. The dentist will then go over teeth whitening options with you. He or she will help you achieve the perfect shade of white for your unique mouth. Can every tooth in my mouth be whitened to the exact same hue? It is not possible for every single tooth in the mouth to have exactly the same shade of white. Some teeth are naturally whiter than others. There is a certain shade of white at which teeth will no longer get any whiter or brighter, regardless of the material or technique the dentist uses. Peroxide moves through the tooth enamel to the middle layer, known as the dentin. Peroxide even moves to the innermost layer in as little as five minutes. Peroxide alters the color of the enamel and dentin while simultaneously removing stains. The typical tooth reaches an opaque state after bleaching. However, a tooth that is already fairly white might not look that much whiter after a teeth whitening session at the dentist's office. Why is it better to have teeth whitening done at the dentist's office as opposed to at home with a DIY approach? The teeth whitening solutions you can purchase in the store typically have a fraction of the strength of the professional teeth whitening solutions available at the dentist's office. Furthermore, in-office whitening safeguards the lips and gums so only the teeth come into contact with the whitening gel. Is it possible for teeth whitening to damage teeth? Research on this cosmetic dental treatment shows low concentrations of peroxide are safe when used as directed following a comprehensive dental examination. It is worth noting that some patients experience slight tooth soreness after teeth whitening. Can one dark tooth be lightened? The dentist will determine why the tooth in question has discoloration. If it requires a root canal or has one, the dentist must bleach it from the inside. This requires forming a minor opening in which to apply the bleach. If the tooth is still alive, a root canal will not be necessary. The dentist can bleach the single tooth with a tray that prevents the bleach from reaching the other teeth. Does the patient's age matter? Most patients are candidates for teeth whitening at the age of 10. By this age, the majority of the permanent front teeth are in position. The only reason to consider whitening a baby tooth is if it endured trauma that altered its color. The teeth of older individuals will bleach quite well if there is not ample root exposure. In general, those who are age 45 and older tend to look about a decade younger after teeth whitening at the dentist's office is performed. 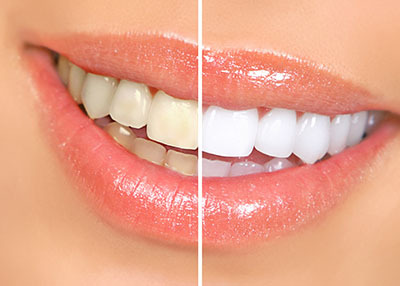 Professional teeth whitening can provide an improvement upwards of six full shades of white.